This week I have added more fun to my Angel bathroom. Handmade Soap! I have been wanting to do this project for awhile, and I finally did it. Oh what fun and easy too. The soaps are White glycerin soap with a little Crushed walnut added to the melted soap. The mold was part of a spa Indulgence kit to make bath fizzies, but I wanted some small decorative soaps for my jar. These four soaps were made from a soap making kit. The Fleur-De-Lis is white soap poured into a mold. The white soap is melted and poured into the leaf part of the mold and set to cool. Clear glycerin soap is melted and gold mica powder colorants is added and poured into the mold. The same process is done for the gold and white layered soap. Fragrances could be added, but I prefer no fragrance. I have the small soaps in the tall jar, and I'm planning to make more in a few weeks. I will show you the process. Now I would love to find a jar for the large soaps and maybe a different mold. "Angels"
A few of my angel decorations in the Angel bathroom. The bathroom is so pretty in the evening with the candles glowing. Thank you for visiting My Cozy Corner. I love to share my romantic Angel bathroom transformation with you. I will be looking for some valance fabric and I will share with you the total new look. Please link back to the great parties. Thanks for stopping by anc commenting on There Wasa Crooked House. I like your post and I love your different angel pieces. I will have to show this to my mum - she is a sucker for cherubs! What a pretty bathroom - I like all the glass and shades of white you've included. 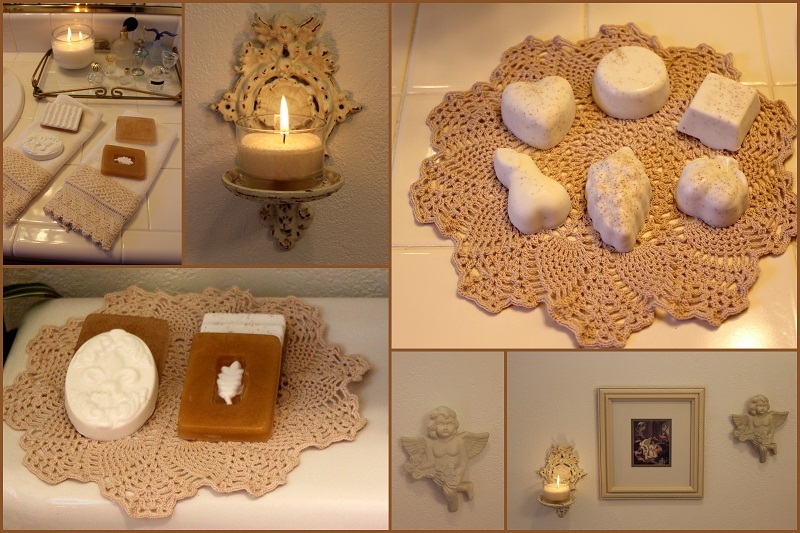 The soaps are a perfect finishing touch! The idea is made up of outstanding and beneficial articles. You're doing the very good perform. Carry on this. I am making a new blog and I am struggling to make it appear good, and supply good quality subject matter.